Bad politicians think of only themselves. Better ones think of politics. The best of them think of ideas. And Telangana chief minister K Chandrashekar Rao (KCR) can never be accused of running short of ideas. The mind of the 65-year-old leader from the Velama caste is like a hectic laboratory that creates an alchemy of ideas faster than the less intellectual politicians around him can assimilate. 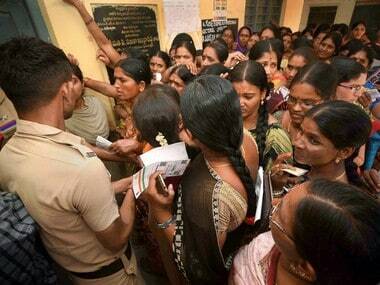 Some of KCR's ideas are indeed of the neighbour's-envy-owner's-pride variety. His Raitha Bandhu scheme of doling out cash to farmers, for instance, was such a fabulous gem of creative appeasement that Narendra Modi plagiarised it without as much as a blink of an eye, calling it the PM-Kisan programme. But some of KCR's ideas fall flat even before he fully pronounces them in his rustic Telugu with Telangana accent. His idea of forming a national party, if necessary, is once such idea. It's not clear whether he was amusing himself by thinking aloud while kicking off his election campaign from Karimnagar on Sunday or he was really serious about it. I'’s also not clear whether the good luck that he believes Karimnagar brings to whatever he does from there extends to whatever he says there as well. His idea of a new party can be described as the culmination of a progression of concepts that originated with his brainwave last year of a "federal front". Such a front, he had said, would ensure the "amalgamation of like-minded people who are determined to reinvent national politics". It was no secret that, in the process, KCR wanted to reinvent himself as a national leader. The post of a deputy prime minister or, with better luck, the prime minister going to the most unpredictable leader in the most unpredictable part of the country in case of a fragmented Lok Sabha election verdict can be a fairly good incentive for joining "national" politics. For a whole year now, the TRS leader has been singing the tune of a Congress-mukt and BJP-mukt Bharat saying that the nation could never achieve salvation unless it is blessed with an alternative to the two so-called mainstream parties. But where is the Federal Front? Nowhere, really. With the noble mission of forming such a thing, KCR had met leaders including Mamata Banerjee (Trinamool Congress), MK Stalin (DMK), Mayawati (BSP), Akhilesh Yadav (SP) and Naveen Patnaik (BJD). Stalin openly supported Congress president Rahul Gandhi as the prime ministerial candidate, while Patnaik may go the BJP way. The rest, in case of a hung Parliament, may be inclined to support Congress. In the end, KCR may himself back an NDA government, depending on the numbers. But at least for now, keeping away from Congress and BJP is essential for KCR in Telangana in his current scheme of things. 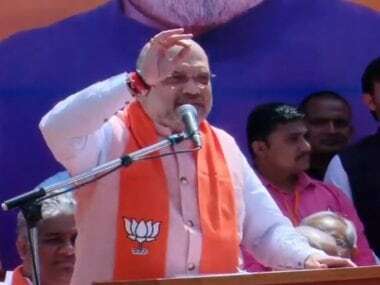 While his main rival in the state is the Congress, he is averse to taking any risk of losing the minority vote by joining forces with the BJP. This political template, along with good governance, was the reason he was able to win a landslide victory in the 7 December, 2018 Assembly election. 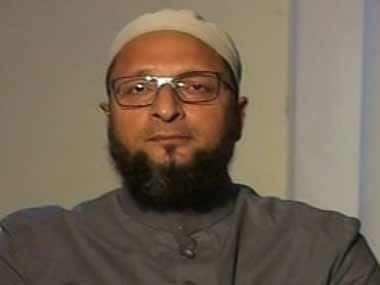 As in that Assembly election, TRS has an alliance with Majlis-e-Ittehadul Muslimeen (AIMIM), a rabble-rousing Muslim party led by Asaduddin Owaisi, in the current Lok Sabha polls. The federal front is a non-starter, although he keeps harping on it. Yet the TRS leader is trying to push himself to the next level by talking of floating a new party independent of the Congress and BJP. The timing and venue he picked for doing it only lead us to a reasonably safe conclusion that it has something to do with the Lok Sabha election. 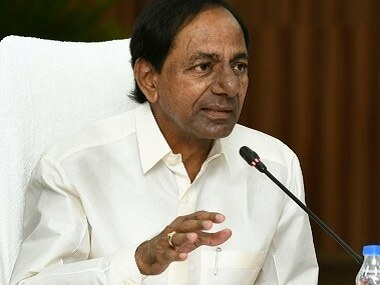 It's more than likely that by speaking of a new non-BJP, non-Congress party at this point of time, KCR wants to dispel the widespread conviction, at least for now, that he will back the NDA after elections. Whatever he does after the results are out, KCR also must contend now with the allegation that he already has some sort of a tacit understanding with BJP. This is at the root of the campaign by Andhra Pradesh chief minister and Telugu Desam Party (TDP) leader Chandrababu Naidu that KCR is part of a BJP conspiracy to defeat him. 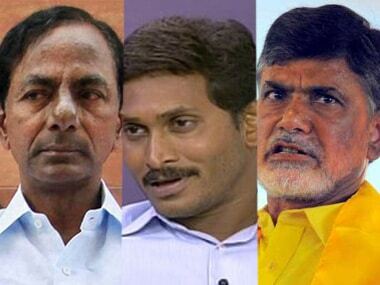 The third member of an "evil" troika that Naidu talks about is Jaganmohan Reddy, the leader of the YSR Congress Party and his main rival in Andhra Pradesh. Talk of KCR's collusion with the BJP can keep Muslims, who make up some 12 percent of Telangana's population, away from him. That isn’t a good thing, when he is moving heaven and earth to win 16 of the state's 17 Lok Sabha seats, with one seat allotted to ally AIMIM. The Telangana chief minister said, "BJP and Congress leaders try to ridicule me by asking what I would do with just 16 seats. I have spoken to parties which share my views and they will have more than 100 seats with them. The TRS, as the driving force, will help the federal front to find a panacea to all the economic ills plaguing our nation because the rulers had no vision." Leave aside the panacea for India's ills for a moment. By coincidence, Janata Dal (Secular) leader HD Deve Gowda had just 16 Lok Sabha seats in Karnataka when he became an 'accidental' prime Minister in 1996. And KCR is also hoping to add Jagan's score in Andhra Pradesh to his own when the numbers are called out after 23 May.